Newton Centre Periodontics | Kathleen E Barrett, DMD, P.C. Healthy gums and bone are the key to keeping a strong and lasting smile. Unfortunately, gum disease and tooth loss are common conditions that threaten the health of the smile. Kathleen E. Barrett DMD, PC helps patients in Newton, Needham, Brookline, and the surrounding communities overcome these conditions through periodontal care. Dr. Barrett is a trained specialist in the field of periodontics; her expertise is in treatments that improve the health of the gums and underlying tissue that support your teeth. Not only are these structures vital to keeping your smile strong, but the health of the gums is also tied to total body wellness. Dr. Barrett offers several different treatments to help keep oral structures free of disease and prevent jaw bone loss and gum tissue recession. As a specialist, Dr. Barrett is qualified to provide the placement of dental implants among other complex treatments that involve knowledge of soft tissue health. Barrett also provides bone grafting and osseodentification to help prepare the jaw bone for dental implants. Dr. Barrett and her staff offer patients the uncommon benefit of extensive professional experience. Not only has Dr. Barrett been practicing Periodontology for over 30 years, but her entire staff has between 20 to 35 years of experience working in a dental practice. Dr. Barrett’s educational background also gives her the knowledge necessary to provide her level of care. In addition to her periodontal certification at Tufts University School of Dental Medicine, she received advanced training and certification in dental implant placement from Harvard University’s School of Dental Medicine. Dr. Barrett routinely goes above and beyond her required amount of continuing education, as she is always looking to improve the quality of care she provides to her patients. 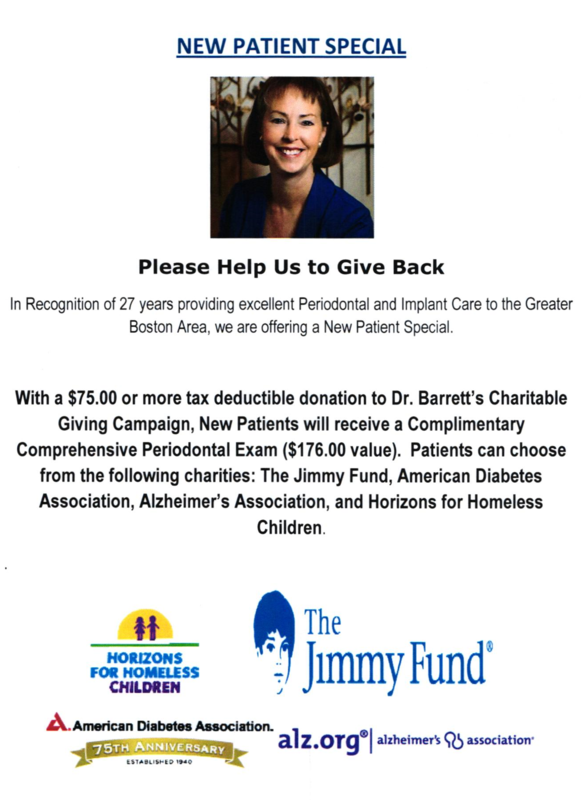 Kathleen E. Barrett DMD, PC provides dental implant placement, gum disease treatments, and other periodontal services to patients in Newton, Needham, Brookline, and the surrounding communities. For more information, contact our practice today!